The weather remains above 85°F (29°C) every day, but for the Lebanese, beach season is over. Now is the time for hikes and mountain lunches and other fall activities – such as grape-harvesting. Yet one more surprise when I moved to Lebanon. The country is home to a prospering wine industry. So the Phoenicians brought wine-production techniques to the Romans, who turned around a brought their love for wine back to the region when they arrived around 64BC. 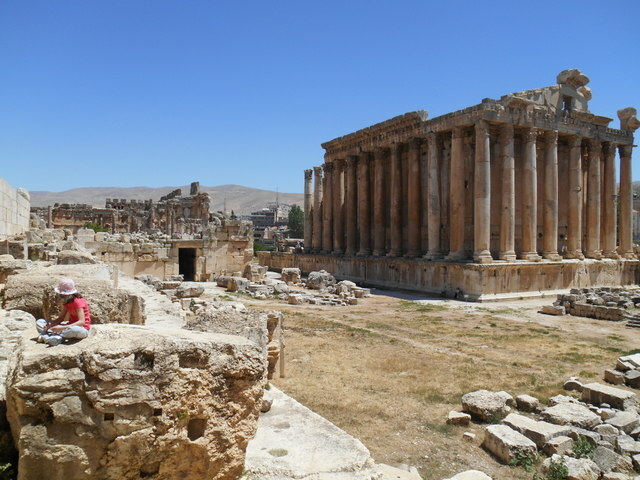 It was under Roman rule that Lebanon’s greatest cultural attraction – the temple at Baalbek, dedicated to Bacchus, god of the grape harvest and wine – was built. In the 1860s, Jesuit priests in Lebanon recommenced wine production, and the industry blossomed during the French occupation (1923-1946). It is said that the French soldiers just couldn’t imagine life without “un coup de rouge” (a glass of red). As with just about everything else in the country, the industry lagged during the civil war, and only five wineries were operating at its end. Slowly growing through the 1990s, wine production has taken off since the turn of the millennium, expanding from the traditional growing areas of the Bekaa Valley, to Batroun, Mount Lebanon, and even near Jezzine in southern Lebanon. An estimated 7 to 8 million bottles are produced annually, with much of going to the export market (primarily Europe). A drop in the wine glass compared to, say, France’s annual production of 7 to 8 billion bottles, but a respectable figure nonetheless. The wineries and their leafy rows of grapes make for gorgeous settings to spend a couple of hours or a day, and our family has visited several: Massaya, Chateau Kefraya, Chateau Ksara, Ixsir. We loved our weekend lunches at Ixsir and Massaya Bekaa, while my kids’ favorite parts of the visits were the underground tunnels at Ksara and the train ride through the vineyards of Kefraya. Ksara and Kefraya are Lebanon’s biggest players, accounting for roughly half of the country’s annual production, but there are currently around 40 producers in this postage-stamp country. 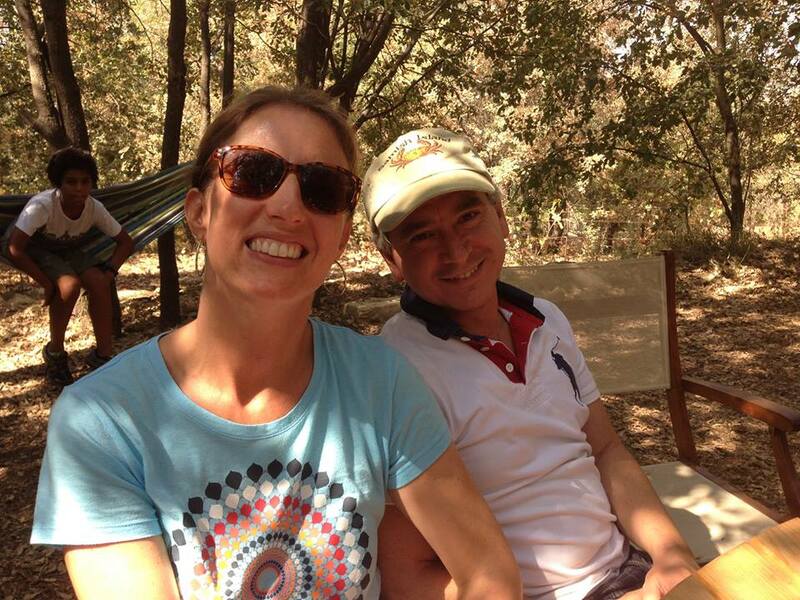 A week ago our family had the opportunity to spend a day with the gracious owner of Cave Kouroum and his family. Located in the village of Kefraya in the Bekaa Valley, this lesser-known winery has been an important player in the industry for decades, first as a grape middleman and eventually producing its own wine. We toured the winery, which has an impressive capacity of 7 million bottles of wine. 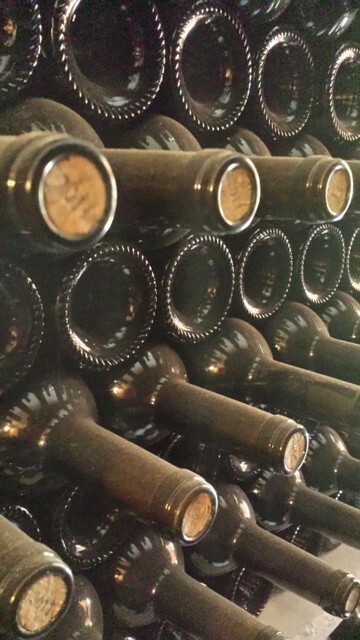 The wine-maker is taking it slow, however, and the estate currently produces 700,000 bottles annually. Our group especially enjoyed the estate’s Petit Noir and 7 Cépages. This past weekend we worked our way backwards in the production line, from the processing of grapes to their harvesting. This time we headed to the hills near Bhamdoun, where we joined the owners of Iris Domain on their final day of the grape harvest. Owner Salmad Salibi explained that the recent heat wave (thank you sandstorm) meant that the different varietals of grapes had ripened all at once, so there was an urgency to their harvesting. To that end, paid laborers had started the hard work at 6 a.m., so guests like our family who rolled in at 8:30 or 9 and later had the chance to clip just a few crates worth of grapes before cutting the kids loose to explore the vineyards and fruit groves, while the adults snacked on man’ouche and sipped the winery’s excellent red blend. You don’t have to be well-connected to enjoy a vineyard visit. The website Beirut.com has a comprehensive listing of wineries in Lebanon with links to their contact information. Several are regularly open to the public, while others accept visitors by appointment. To try all the wines in one place, head to the upcoming Vinifest, October 7-10 at Beirut’s Hippodrome. This wonderful event brings together winemakers from around the country, offering tastings with bottles (as well as olive oil and snacks) available for purchase. (Tickets L. 25,000 and can be purchased at the entrance or ahead of time at Antoine.) With around 40 producers showcasing their wines, take my word for it that it’s impossible to try them all. But my husband and I have had fun trying. My husband and I were caught by The Daily Star photographer Mahmoud Kheir in this image from Vinifest 2012. But enotourism in Lebanon is on the rise. Chateau Khoury has opened a restaurant, while Domaine des Tourelles and Cave Kourom are developing theirs. Chateau Belle-Vue hosts both a restaurant and a hotel. 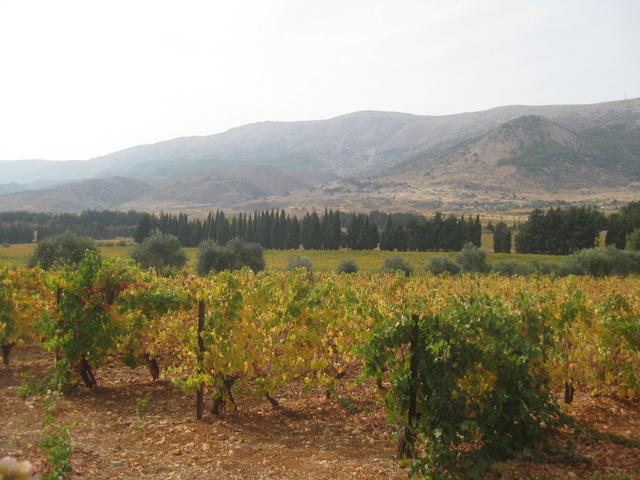 Wineries near Batroun in Northern Lebanon have worked to develop a wine trail. The Romans may have left Lebanon ages ago, but clearly the devotees of Bacchus remain alive and well. Special reports on Lebanon’s wine industry and developing wine tourism were recently published in Executive magazine. The 2012 Zawaq guide to Lebanese wine has tasting notes for over 100 wines. The bilingual (French/English) book is currently 40% off on Antoine’s website. 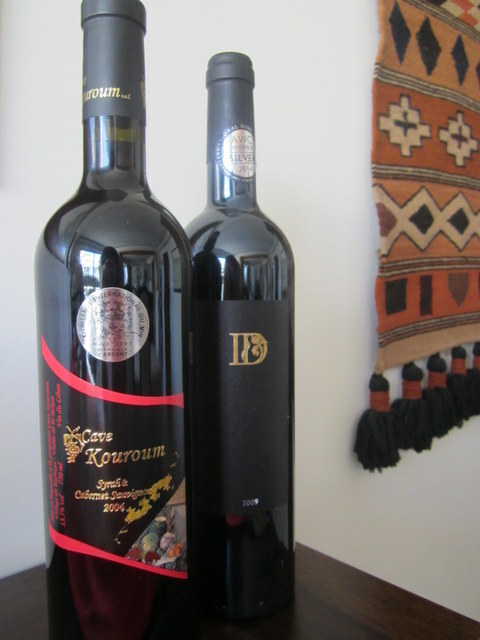 Michael Karam’s Lebanese Wines (2013) offers tasting notes by the owner of Jezzine’s Karam Winery. Facebook tends to be the best place to find out about events and visits at most wineries in Lebanon, with more current information than the winery websites. All the news coming out of Lebanon lately is garbage. Oops, I mean it’s about garbage. And since everyone else is covering garbage, I figured it would be nice to talk about something else that is happening in the country, because there always is so much more happening in Lebanon than what you see in the headlines. So I’m going to move from garbage to green. On Saturday, I went with my husband, my daughter, and a couple of her friends, to Horsh Beirut. 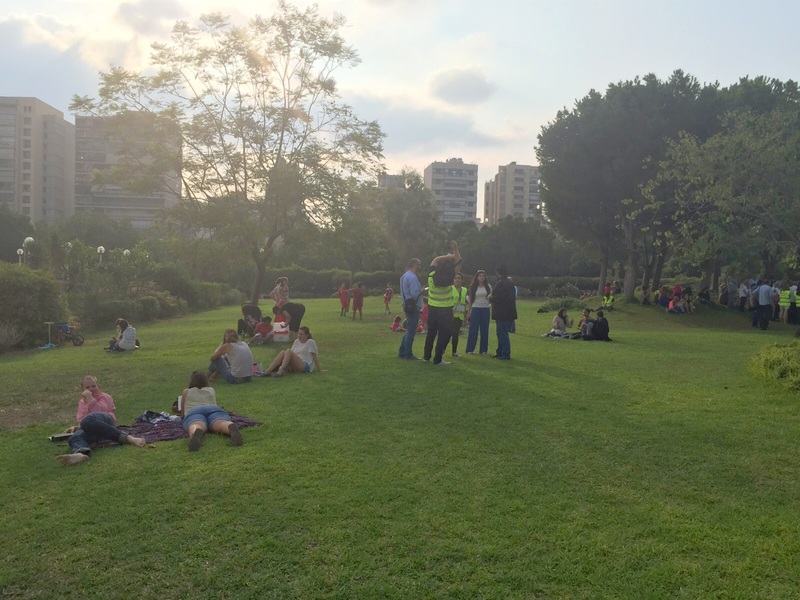 The 300,000+ square meter (74 acre) park comprises a whopping 70 percent of all green space in Beirut. Notoriously, it has been closed to the public for the past 20 years. There are exceptions. Permits are allowed to Lebanese who are 35 or older and provide a doctor’s note stating that they need exercise. And foreigners – at least Western-looking ones – have been allowed in without permits. But for the past two decades, your average Lebanese citizen has been stopped at the gate and denied entry. 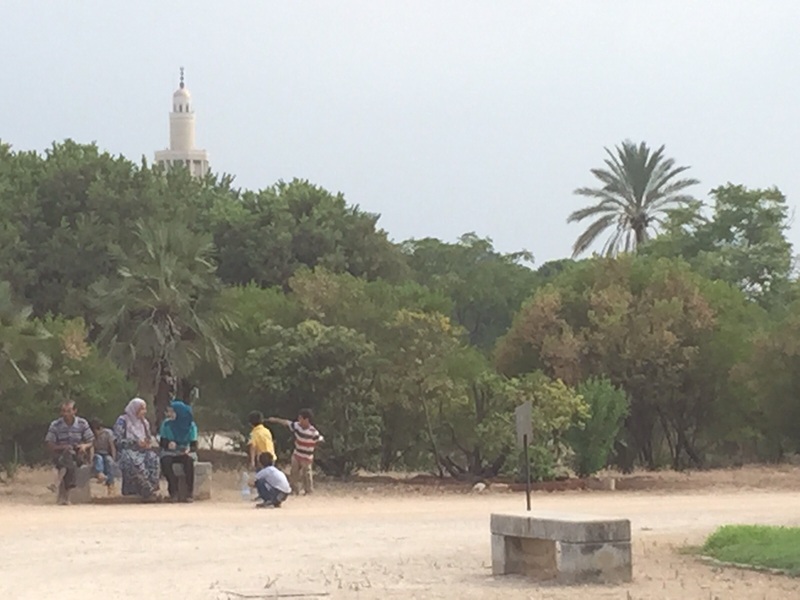 Thanks to the tireless work of the NGO Nahnoo, after four years of fighting the good fight, the park has been reopened to the public. The opening is gradual: Saturdays only for the month of September, Saturdays and Sundays in October, and eventually, open every day. Nahnoo’s executive director, Mohammad Ayoub, explained that the measured reopening will allow the municipality to address any hiccups that might arise. Ayoub also said that around 100 volunteers for Nahnoo helped out with the park opening – disseminating park rules and making sure that all ran smoothly. Kudos to Nahnoo, its staff and volunteers, for their persistence in advocating for the opening of this important public space, and to the European Union and United Nations Development Programme (UNDP) for funding the project. Yesterday I met a pair of Lebanese friends for coffee and told them about my visit to Horsh Beirut. Neither has ever been, and they asked what there was to do, considering if it might be a good place to take their kids. Kids can bring their bikes, but adults won’t be allowed on bikes nor will there be a bike rental. The paths are dirt, so not great for scooters or skating. Balls are allowed, but no ball games. There isn’t any play equipment. There is a restroom, but in disrepair. A picnic is the obvious choice, but to that end it seems like there ought to be a lot more trash cans. 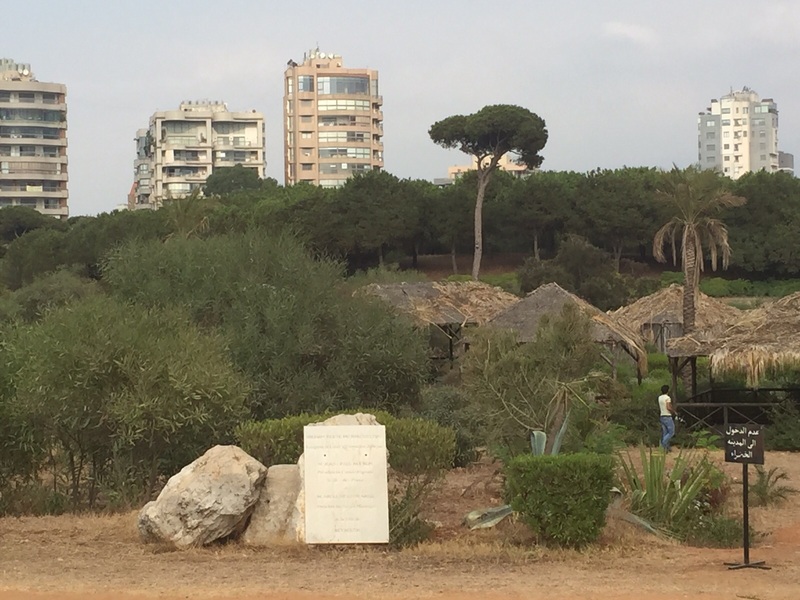 On a brighter note, the greenery is lovely and well-maintained, and UNDP also funded a public water fountain that was recently installed (the first I’ve seen in Beirut!). 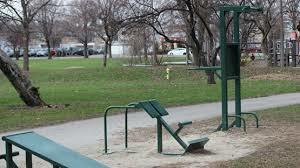 A fitness station in a city park in Chicago. This company and this one sell ready-made equipment, but stations can also be as simple as recycled beams and tires. 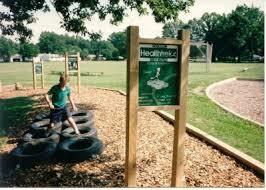 Again, there are excellent resources online about how to design a playground made with anything from recycled tires to state of the art equipment. There are websites that provide guidance on how to build a playground, how to get grants, how to find corporate sponsors and more. For equipment, a company called Playmart caught my eye: they purchase post-consumer and post-industrial plastic to upcycle into playground products. (Wish they would open a factory here, Lebanon has plenty of plastic garbage it could sell!) 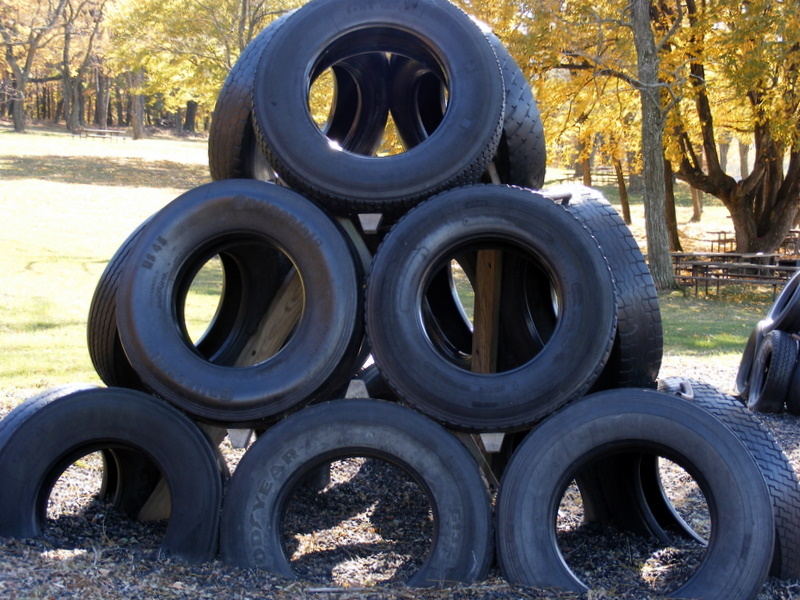 This website even has a 117-page instruction manual for making playground equipment out of old tires (as well as inspiring images of parks around the world with beautiful construction and landscaping). Establish an area open to ball games. 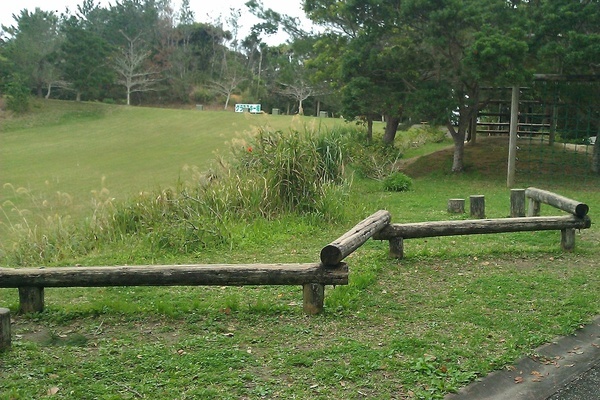 Whether that is a soccer pitch big enough for a five-on-five game, or just an area where friends can kick the ball around without worrying about the wrath of park security, it would be fantastic to have a space where kids can get some exercise and have some fun. And with all the water & sanitation experts currently in the country to address the refugee crisis, I am sure we could find someone to give some advice on toilets! Nahnoo has tapped EU & UNDP for the funding for its campaign; what NGO could take the next step in creating opportunities for play and exercise? Funders must be out there, maybe someone to support healthy spaces that benefit host communities and refugees alike? Gates, Aga Khan or Ford Foundation? Or a corporate sponsor such as Coca-Cola, Pepsi, Nike? Nahnoo, are you taking this on? 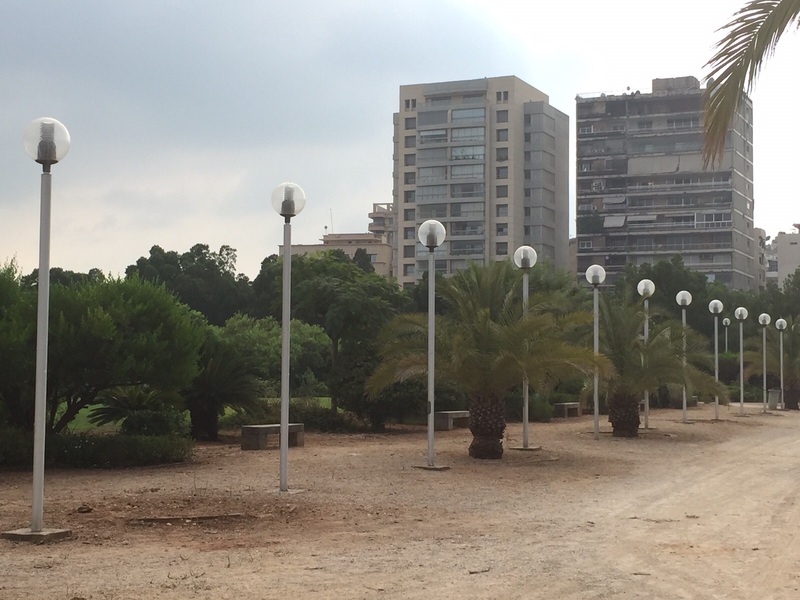 Beirut Green Project? Let me know who is, and I’d be happy to join in as a volunteer….